All aboard for a fun filled Tour of Hahndorf. We travel to Avoca via Castlemaine for morning tea. The town and river were named after Avoca the village and River Avoca in County Wicklow, Ireland. We stop at Horsham for lunch before continuing on to Bordertown for afternoon tea. We arrive at Hahndorf where we settle in for four nights stay at The Manna of Hahndorf to freshen up before dinner. We enjoy breakfast before departing the motel and travelling to visit the Herbig Family Tree. The Herbig Family Tree is a large, hollow red gum tree at Springton. The tree was the first Australian home of Friedrich Herbig who arrived in South Australia in 1855. We then travel on to Maggies Farmshop. A visit to Maggie Beers Farm Shop is an absolute must whilst in the Barossa Valley. Maggie Beer cook, writer and founder of Maggie Beer Products, offers tastings and sales of her full product range including limited edition seasonal produce. Following lunch we visit the National Motor Museum at Birdwood then onto to see the Worlds Largest Rocking Horse & Wooden Toy Factory at Gumeracha. The Toy Factory, the largest in Australia where you can buy wooden toys including rocking horse souvenirs, childrens wooden toys and much more. We then return to our motel for Dinner. After a satisfying breakfast we have a bit of free time in town to explore Hahndorf. Hahndorf is classified as Australias oldest surviving German settlement and each year thousands of people, young and old, enjoy its charm and the hospitality. 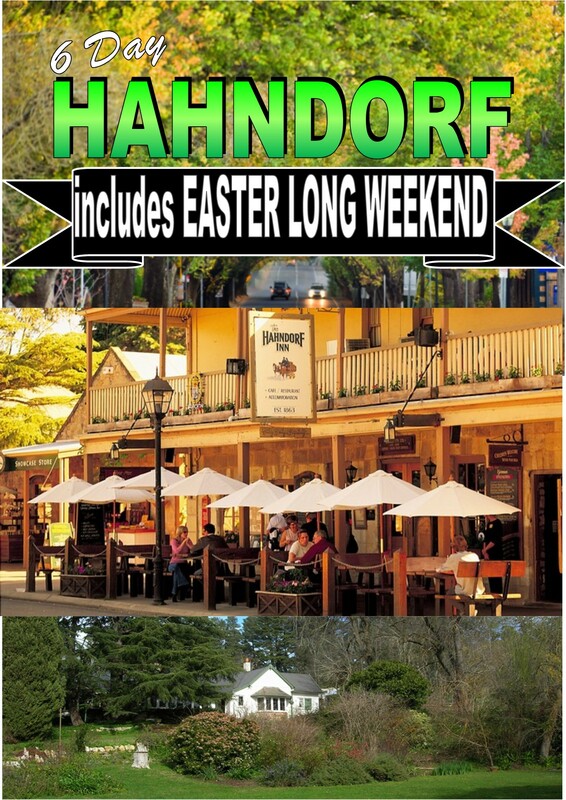 Hahndorf is the jewel of the Adelaide Hills and one of South Australias most popular towns. When visiting Hahndorf, the most striking features that greet visitors are the over 100 year old elm and plane trees that line the Main street and the original Fachwerk buildings, many beautifully maintained or restored to original conditions. We enjoy a tour from Hahndorf Academy then continue on to visit Heysen House and tour The Cedars. The Cedars is a unique 60 hectare heritage property on Heysen Road, near Hahndorf in the Adelaide Hills, South Australia. The Cedars is the historic home of one of Australias most noted landscape artists, Sir Hans Heysen. We have lunch in Hahndorf and more free time to continue exploring this beautiful and interesting town, and maybe a bit of retail therapy. We then return to our motel for Dinner. After dinner we travel to Eagle on the Hill outside Adelaide to see the night lights. Eagle On The Hill is an unbounded locality of Adelaide in the Adelaide Foothills. It borders Mount Osmond and Waterfall Gully. A leisurely start today as we discover the beauty and tranquillity of the City of Adelaide. We enjoy a City Sights tour taking in St. Peters Cathedral, one of Australias finest cathedrals. Our tour also takes in Lights Vision for one of the best views overlooking the city for a fascinating look at the contrasting blend of historic architecture and unique land marks. Then we visit Ayers House Museum a grand 19th century home constructed of local bluestone. We enjoy some free time to browse in the Rundle Mall and have lunch. This afternoon we cruise the beautiful waterways of West Lakes on board the West Lakes Princess. We tour through Port Adelaide and onto the popular seaside suburb of Glenelg before we farewell Adelaide and return to Hahndorf. Wake up, time for breakfast! Then we have time for early church services then its all aboard as we head off this morning to the Monarto Zoo the largest open range zoo in Australia. It is a 1,500 hectare open range sanctuary undertaking a major role nationally and internationally in breeding programs for rare and endangered species. It is the home of South Australias first ever southern white rhinoceros and Australias largest giraffe herd. We also enjoy our lunch at the zoo in the beautiful surrounds. After lunch we depart for Loxton where we spend the night at the Loxton Community Motel. After our last breakfast we make our way to Pinaroo for Morning Tea. We travel the Mallee Highway to Ouyen for our lunch break, then its time to say our farewells and make our way home through Echuca for Afternoon Tea with a chance to reflect on our relaxing and enlightening tour of beautiful Hahndorf and Adelaide, the Garden City.